One of my favourite things about summer is stonefruit, it's never around long enough. This year, I've decided to experiment and make some summery liqueur to get me through the winter months. This will be a 3 stage process, so I will post part one now, stay tuned for the rest. To start, I bought a kilo of the best stone fruit I could find. It should be fully ripe and free from blemishes. 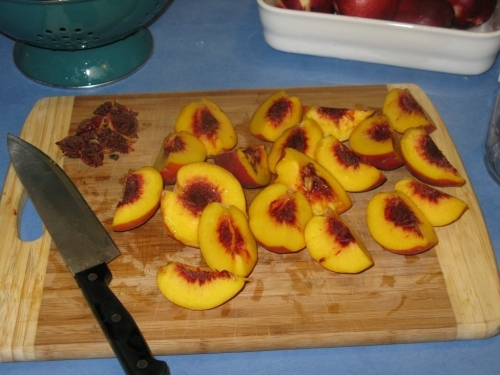 I'm trying white nectarines and yellow peaches. Give the fruit a quick rinse to remove any nasties or extra peach fuzz. You will also need a jar with a good seal to put everything in. I bought two 1L capacity jars with rubber stoppers from The Reject Shop for about $2 each. 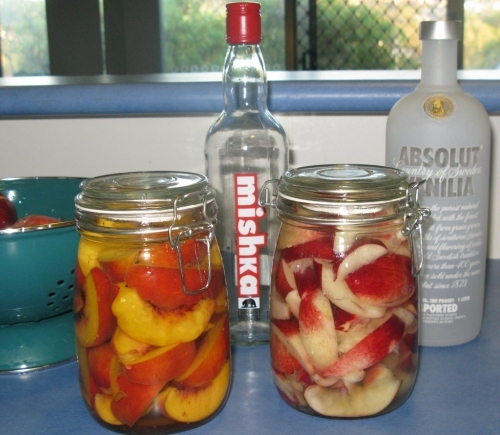 Finally you will need about 500mL of vodka per 1L bottle to soak the fruit in. Vodka works the best as it will not give a strong flavour to the fruit. 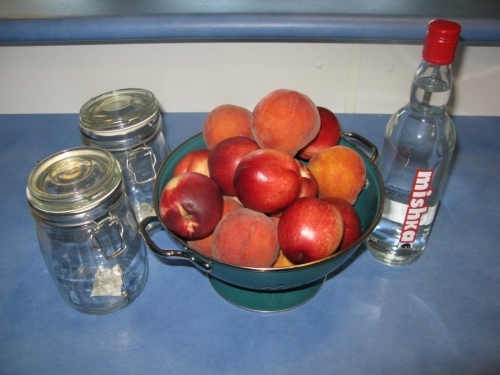 I used plain vodka for the nectarines, and vanilla vodka for the peaches. Cut the fruit in half, remove the seed, then cut each half into four. This size gives a good amount of surface area in contact with the alcohol, but the pieces are big enough that they do not entirely dissolve. The skin should be left on, hopefully to impart some colour to the finished liqueur. Fill the jar to the top, loosely packed. You may or may not use all of the fruit. Pour the vodka over the fruit to the top of the jar. Ensure that the top layer of fruit is entirely covered in alcohol as any fruit exposed to air may spoil. 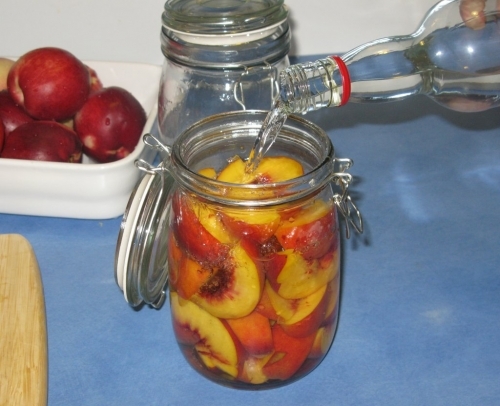 Seal the jars and place in a cool dark cupboard to infuse for at least two weeks. 1 haha thats freaking awesome! i want to know if its tasty!